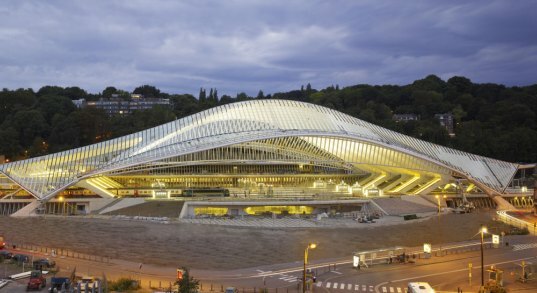 Liège, Belgium recently unveiled a stunning new high speed rail station that will serve to further connect Northern Europe’s rail lines. Designed by Santiago Calatrava, the Liège-Guillemins TGV railway is a beautiful glass and steel construction that is distinguished by its transparent exterior and its elegant transition between the city and the station. 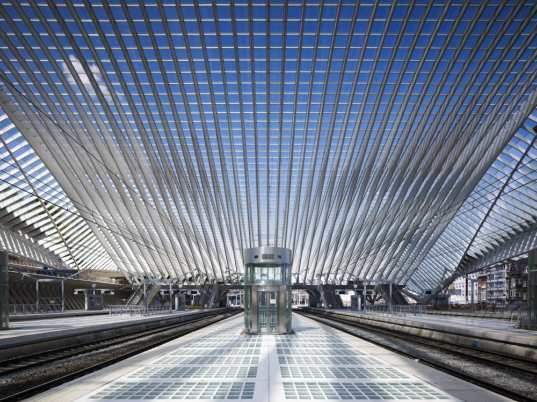 Calatrava’s Liège station began construction in 1996 and was designed to provide rail service for 36,000 people a day. The structure’s transparent vaulted canopies rise 145 meters above the 5 platforms, while down below a series of pedestrian walkways provide access for travelers. The rail station is densely stacked and includes vehicular access for passenger pickup, parking levels and commercial retail space on the street level. Calatrava’s vision for the station was a building without a facade that provides greater connectivity within the city. The platforms on the top levels are enclosed by glass and steel framing, and the entire station makes great use of natural daylight. Modern high-speed and low-carbon travel is now a reality through this important node in Belgium, which offers quick and efficient travel to Aachen, Cologne and Brussels, Frankfurt, Paris, London, and the Southern portions of Europe. Santiago Calatrava said: “It was my goal to create a 21st century transportation facility that would not only unite Liège with the rest of Europe, but would also serve as a symbol of the city’s renewal. The project, as a whole, creates a new gateway into Liège and re-establishes a relationship with the city”. is it just me or did he use the same details as in the Lisboa Oriente? Even the elevator cages look the same! I love Calatrava, and this is just a beautiful station for a building type I love - and hope we will one day have more of in the U.S. If only we will have some new ones as magnificent as this. Liège, Belgium recently unveiled a stunning new high speed rail station that will serve to further connect Northern Europe's rail lines. Designed by Santiago Calatrava, the Liège-Guillemins TGV railway is a beautiful glass and steel construction that is distinguished by its transparent exterior and its elegant transition between the city and the station.